On 28thJuly 2016 TCL launched new range of FHD & 4K UHD TVs with Smartphones in an Launch Event in Bengaluru. This whole range of TCL LED’s including Smartphone is available for sale, on Amazon India’s Website. Details of TCL TV's as follows : In Bangalore Event two models of LED TV in 40-inches and 32-inches screen sizes, are unveiled by Mr. Praveen Valecha, Regional Director – TCL India. All the models includes a powerful ASIC processor and feature LED quality with more than One million pixels, 1080p HDMI video format, which means increased clarity and picture detail. TCL D2900 Series - The Creative Life. The best of visual experiences is just a touch away with the L32. Packed with features like, all time Running Dynamic Skin color and Blue color control, Black level stretch for Contrast level enhancement, 3-D Chrome Filter and 3D Adaptive De-interlacing to reduce De-Mosaic Noise, we offer you nothing short of extraordinary. The Dolby surround sound with integrated speakers guarantee high quality audio output with the Dolby decoder, Smart Volume which eliminates unwanted spikes in Audio, to give you a richer and more captivating audio experience. Additionally, various picture and audio mode options heighten your visual experience and let you enjoy the intensity of sports and action programs. 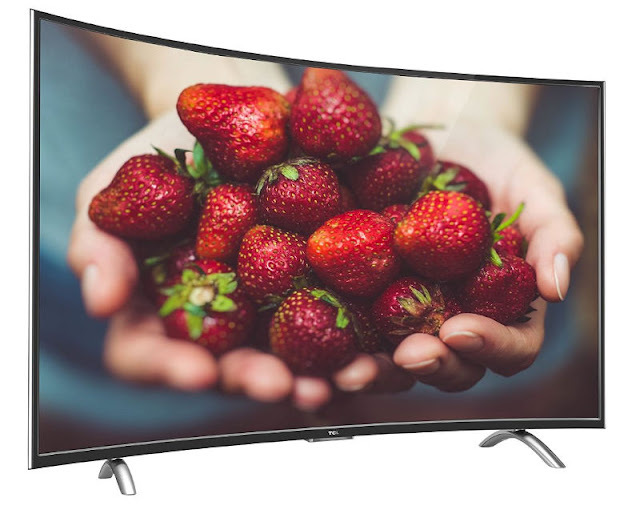 TCL P1 series (Full HD) - The 48’ (121cm) Curved Full HD Smart TV comes with a slim and Lean design will forever change your visual experience, with over One million pixels enjoy more accurate and detailed visuals. Designed to be the envy of many, the segmented body looks slim and light, with an overall thickness of 69.6mm, the thinnest part is only 12mm. The latest generation of TCL’s LED backlight creates a milestone in LED backlight technology with a dramatic enhancement of color gamut and dynamic contrast ratio, the picture has never been as realistic. The newly launched TV is Smart because it’s easier, faster, and a more intelligent way to surf content on a single device or across multiple devices. TCL’s Curved C48 Smart TV contains upgraded functions like screen mirroring, built-in- Wi-Fi, Wi-Fi direct, App Store and much more designed with rich content to completely suit your lifestyle. Users can discover a world of applications with the App store 3.3 which provides a range of applications from video-on- demand, to social, gaming, and music. Users can also record and play back the programs whenever they want. So, never worry about missing your favorite show again with the PVR Record and Playback which records the program to the USB. All these models are available on http://www.amazon.in website.